Pot mums are a versatile crop. 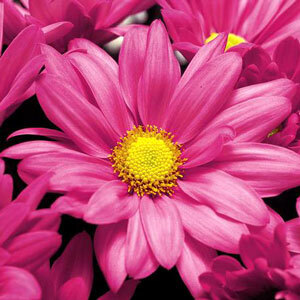 They are a classic garden plant, often referred to as a Chrysanthemum. Pot mums can be grown in almost any size and container type, which expands their marketing possibilities. Pot mum rooted cuttings must always be planted in moist media. Make sure the cutting is planted deep enough to cover the roots. If your soil is well drained, you can plant it a little deeper to anchor the plant more. Well-drained, well-aerated media is important, to prevent rot. But it must also have good moisture-holding capacity to firmly anchor the root system. Pot mums require a lot of water and fertilizer, but allow the media to dry some between irrigations, to help develop root growth and prevent root rot. On the other hand, do not allow the plants to wilt. Thorough irrigation with leaching is ideal. At the time of planting, use a complete N-P-K fertilizer, such as 20-10-20 at 200-300 ppm nitrogen. During initial stages of growth, pot mums are heavy feeders. Constant liquid fertilization is recommended. A 300-400 ppm solution of N (soilless growing media) will produce high-quality pot mums. It is important to note that fertilization should be reduced or eliminated during the final two to three weeks of the crop. This increases longevity. During the final three to four weeks of development, it is beneficial to lower the night temperatures to 56-60 degrees F with day temperatures of 61-65 degrees F to enhance flower color and strengthen stems. There are three types of bud removal currently practiced on pot mums. The type you use is variety specific, so make sure you use the correct bud removal process for your variety of mum. All kinds of bud removal need to be done on time of finished quality is diminished. Pinching is required to create fuller plants. Pot mums flower under short days. From approximately September 20th until March 20th, the days are short enough to induce flowering naturally. Pot mums need at least 12 hours of uninterrupted, total darkness to initiate and develop flowers. During the initial growth stage, pot mums require night lighting. This is to create long days that maintain vegetative growth. The number of long days required will vary depending on your desired finished plant size. During long days do not allow more than seven hours of continuous darkness to occur. Artificial long days can be created by lighting plants from 10:00 pm - 2:00 am with 10-15 foot candles or 1.5-2.0w/sq m.
Pot mum cuttings must be pinched. Before pinching, make sure the plant is well rooted and established. Pinch the top .5"-.75" of new growth. Five to seven leaves must remain on the cutting. No rooted cutting is needed in the center of a mum pot. Plant rooted cuttings near the outside edge of the pot, spaced equally apart. One to three rooted cuttings are recommended for a 4" or 4.5" pot. Four or five rooted cuttings are recommended for 6" or 6.5" azalea pots. Quality will suffer if plants are not properly spaced. B-Nine plant growth regulator is the most commonly used growth regulator for height control in mums. The amount used and timing of B-Nine will depend on the cultivar, temperatures, and light intensity. When desired, growth regulator is applied about two weeks after a pinch. A second application may be needed in two or three weeks. The last application should be no later than the center bud removal stage to avoid adverse effects on flower form or color. B-Nine rates range from 2,500-5,000 ppm depending on the variety and time of year. Higher rates are used for tall-growing varieties and during the warmest, brightest growing seasons. Leafminers can cause serious damage to mums. Monitor the growing area with yellow sticky cards so you can check for adult activity. Thrips can also be a problem in mums, especially when the mums begin to bloom. Verticillium wilt, Fusarium wilt, and chrysanthemum stunt should not be a problem because they are controlled by our clean stock program and maintained through our clean protocols. Also, proper environmental control of factors such as ventilation, heating, and watering minimizes the occurrence of other pathogens. Be sure to maintain clean practices at your greenhouse to continue to prevent these diseases. Disease prevention is more desireable than suppression. Other common diseases that the customer will need to watch for are Pythium, Rhizoctonia, powdery mildew, and Botrytis.